I intended to write an article following up my February piece, “Join or Die.” The editorial generated a wealth of discussion on one forum to which it was posted, but on most of the other forums I received little or no feedback. Initially I thought of compiling the highlights of the discussion and presenting them here, but after further consideration I decided against it. Inevitably I would likely overlook someone’s valuable input or simply miss something which merits attention, possibly as an entirely separate consideration besides what I wish to discuss here. I may have also inadvertently mischaracterized the main thrust of my train of thought, which I hope to further develop in this article. For those interested in reading a lively discussion generated from “Join or Die,” I recommend the Field Herp Forum “Board Line” message thread, “For Discussion—The Future of Herp Organizations,” found at http://www.fieldherpforum.com/forum/vie ... 20&t=15083. The focus of this article is to attempt ONE way to model the “herp community” and potentially provide some direction. Keep in mind this is only the author’s perspective and others’ points of view most likely differ, but I hope it is a starting point from which to develop. If you participate to any extent in the hobby, avocation, or industry revolving around reptiles and amphibians (collectively, “herps”), you’ve almost certainly been peppered with warnings of threats to said hobby/avocation/industry. There are many options for responding to these threats. Are they all helpful? Does it matter to which particular method of response you choose to devote your time, money, and talent? Are there too many organizations within the community, all vying for the same limited pool of time, money, and talent? What, or who, IS the “herp community” anyway? Defining the “herp community” must necessarily be broad in scope. I wrestled with how best to convey my thoughts on the matter, and figured a picture is worth a thousand words. It may not be the optimum portrayal, but as previously mentioned it may be a useful point of departure. What I perceive as the “herp community” can be loosely described by referencing Figure 1 (below). The community itself is depicted by overlaying several arrows on top of the “non-herp-oriented public.” The orientation of the individual arrows is important, as I will explain later. The vertical arrow on the right is a general trend—downward orientation on the depiction of the “herp community” translates into states of being (who a person “is” with regard to the “herp community”) I perceive as detrimental to the animals themselves—on an individual-specimen basis and/or to species/ecosystems as a whole. Similarly, upward orientations reflect states of being I see as beneficial to the herps. The vertical arrow on the left, in the general sense, is something I think everyone can agree on as a concept. That is, the overall goal of the “herp community” should be for the betterment of reptiles and amphibians—which, not coincidentally, will in turn contribute to more ability for interaction from the people who appreciate them. I’ve depicted the goal arrow as a dotted line, and placed a question mark within it, because this will be the most difficult task ahead—specifying exactly what that goal looks like—and it may take on slightly different forms for different groups (hint: a herp society’s “mission statement” might be a good fit). In the figure, I’ve identified several groups: field herpers (those who seek reptiles and amphibians in the wild), herp keepers (those who maintain specimens domestically, including breeders who sell specimens), the general public, and academia (researchers and so on). The general public is the foundation of the model, and the largest arrow (though not to scale; there is insufficient space to represent it accurately!). The “detrimental” posture (pointing downward) can best be described as “uninformed citizens;” people who dislike snakes out of innate (or taught) fear, or act out of simple indifference (e.g. not swerving to avoid a turtle on the road, but not necessarily because of malicious intent). I’ve labeled the “favorable” posture as “sympathetic,” by which I mean the public who, while not rushing out to photograph, catch and observe, maintain domestically, or otherwise enjoy reptiles and amphibians on a personal level, are at least sympathetic to the animals’ deserving to be treated equally with other, more “cuddly” creatures. Unfortunately, at this time I feel it is most accurate to depict the majority of the public as “uninformed” (or at least “underinformed”); hence the arrow being longer in the downward direction. The two primary “herping” factions are depicted as arrows largely pointing in different directions—on purposes. Sometimes these two groups are at loggerheads (ha!) with each other, as their goals sometimes seem conflicting. However, I oriented both arrows upward with respect to the “beneficial to herps” trend. 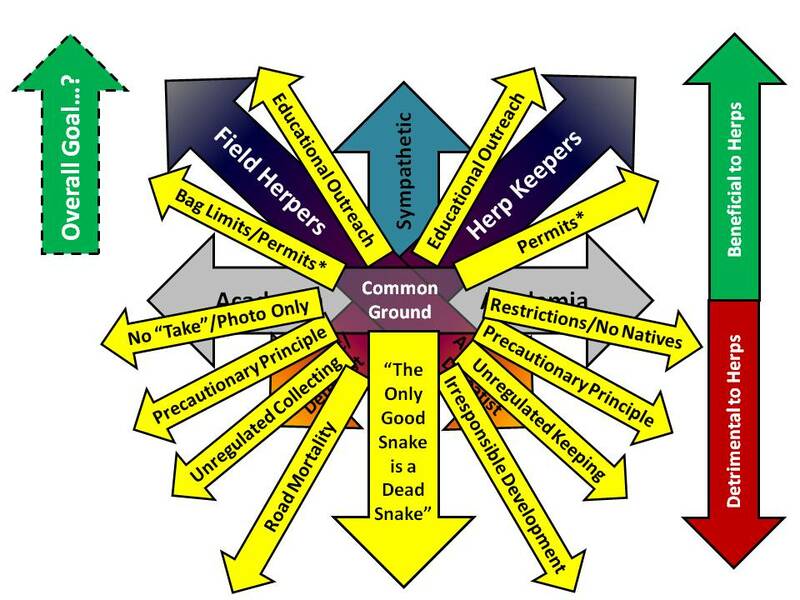 On the other hand, as you can see in the diagram, each group has actors which can be detrimental to the interests of their community and to the herps they love—either on a conscious level or inadvertently. I’ve labeled such folks as “apathetic” (those who say “just leave me alone; I’m going to enjoy herps the way I see fit; laws or no laws”) or “defeatist” (those who say “you can’t fight City Hall; no use trying; let’s just remember the good old days”). The “academia” arrow was placed horizontally for a carefully-considered reason—to maintain the integrity of their effort. Data and research support knowledge, which in itself should be viewed as neither beneficial nor detrimental (outside the intrinsic perceived benefit of knowledge)—however, what other groups choose to DO with that knowledge can have an effect one way or the other. The horizontal academic arrow therefore reflects impartiality. In the middle of the diagram is “common ground.” Regardless of the specialized focus of any of the groups depicted, there is a Venn-diagram-like shared area. Some field herpers catch and keep some of what they observe. Some herp keepers like to keep exotics, but go field herping to observe natives. Some academic researchers maintain a collection for fun, or enjoy taking friends to study site. This common ground of shared interest is where time, money, and talent can have the greatest impact. This description of the “herp community” and its relationship with greater society is by no means a perfect one. However, as previously mentioned, I think it is a workable model from which to proceed. Now that a basic framework of the “herp community” has been established, I will overlay the model with issues and actions affecting the community and reptiles and amphibians in general. Figure 2 (below) shows what I think are some of the bigger issues; it is not an all-inclusive illustration (I wouldn’t have room to show them all!). The size of the arrows corresponds to the relative magnitude of the issue/action; the length of the arrows translates to the relative impact. 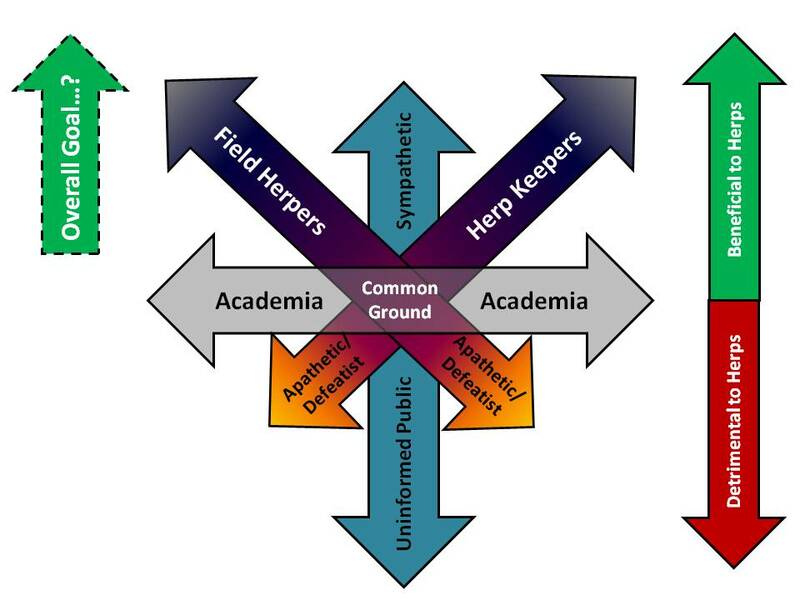 For the most part, the arrows are aligned left/right with the subset of the “herp community” to which they are most relevant. The orientation of the arrows is my impression of the extent to which each issue/action affects reptiles and amphibians. Of particular importance, the arrows are all the same color. That is because these are all issues which the “herp community” can influence. The old cliché “The only good snake is a dead snake” dominates the “uninformed” or “underinformed” public arrow. This attitude is pervasive and has, in my opinion, the most severe implications, because it represents willful attacks on reptiles and amphibians. It will be the hardest attitude (with its result of indiscriminately killing snakes) to mitigate. Road mortality and irresponsible development are two arrows which are not necessarily aligned with any particular subset of the “herp community;” I had to place them where I could, given limited space. Road mortality differs in that some people run over animals maliciously while others may not even realize they’re doing it (especially with smaller species). On the other hand, irresponsible development harms reptiles and amphibians, though not out of any specific intent (I know of no housing tract or golf course built primarily to wipe out reptiles and amphibians; such eradication is merely an unintended consequence). I have listed the “precautionary principle” twice—on both the field-herping and herp-keeping sides of the model—because it can negatively impact both subsets of the community (and, ultimately, the well-being of reptiles and amphibians). For those unfamiliar, the precautionary principle in a nutshell says in the absence of data to support an action (such as managed collection), the action should be prohibited, “just to be on the safe side.” This is how some states and municipalities justify “hands-off” policies for native species, or restrictions on what (if any) species can be maintained in the home. Focusing narrowly on immediate effects, the precautionary principle may be perceived as helpful, as it could conceivably reduce pressure on native reptile and amphibian populations. However, the long-term effect could be quite the opposite—with citizens unable to interact with reptiles and amphibians, nobody will know or appreciate these animals. Nobody will be overly concerned with the negative consequences of roadkill or development, for they will have no special connection with the animals. The remaining “detrimental” issues more closely align with the main subgroups of the “herp community” (as depicted in the model). First, let’s look at the issues affecting field herping. The first issue is unregulated collecting. Generally speaking a complete lack of regulation is neither desired from a field-herper’s perspective, nor is it an advisable stance on a scientific basis. Another, perhaps less intuitive, detrimental issue is also a regulatory concept, but one at the other end of the pendulum swing—a “hands-off” mentality, which in some extreme cases even limits the ability to photograph animals in the wild (because getting a good shot may involve “pursuit” of an animal, which can fall under the definition of “take” and therefore be forbidden). Such a hands-off approach may seem agreeable to those who think any interference with wildlife is a bad thing, but again this goes back to the “precautionary principle” with its unintended negative consequences. The final two detrimental issues fall most closely in the realm of captive maintenance of reptiles and amphibians. Many of us are all too familiar with unreasonable restrictions on numbers and/or types of animals which can be kept domestically. In some cases, “exotics” can be kept, but not native animals; perhaps due to some perceived unsustainable demand for locally-available species. This has the (presumably) unintended consequence of making outlaws of every child whose first experience with nature may be a toad from the backyard. Though perhaps kept in a small container for only a few days, such an experience may well spark a lifetime passion for biology. Conversely, as with field-herping regulations, a complete lack of any restrictions or guidelines for maintaining domestic reptiles and amphibians can also have disastrous results. For example, impulse purchases at poorly-monitored venues (e.g. flea markets) generally don’t end well for individual specimens; it is debatable which is worse—a lingering death from ignorance of an animal’s needs, or being released into the wild (especially where the animal is not native) to fend for itself or frighten people who aren’t “herp friendly.” There is no need to go into detail here about the current problems with breeding populations of non-native species, but they are potentially symptomatic of the larger problem of under-regulation. If so many issues work in concert to the detriment of reptiles and amphibians (and, as a result, our ability to enjoy them), what can be done to improve their (and the “herp community’s”) lot? A few come to mind; I’m sure others within our community can exercise our collective creativity to devise more. Our overarching goal should be the betterment of reptiles’ and amphibians’ predicament in the world. However, our sphere of influence is PEOPLE. It’s naïve to tell ourselves “only the herps matter; I don’t concern myself with the people involved.” We can wish or hope for populations to improve in health, but they would get on just fine if we totally left them alone. Unfortunately, mankind has a long history of NOT leaving the natural world alone—nor should we necessarily be expected to. However, we CAN manage our actions to minimize negative impacts. Who should we be looking to influence to manage these actions? Not every field herper wants to keep herps. Not every herp keeper wants to field herp. We need to influence the public. The goal isn’t to make them “snake lovers” necessarily, but to make them “sympathetic.” More importantly, “the public” is largely where lawmakers originate—there are precious few amateur herpetologists holding elected office. The single biggest action we as a community can take, regardless of whether we primarily field-herp or keep reptiles and/or amphibians domestically, is to EDUCATE. Field herpers can do this by publicizing their efforts in the field of “citizen science.” Many Federal, state, and local agencies are forming partnerships with organizations such as the North American Field Herping Association (NAFHA) to collect data on native species, especially where available in-house personnel and resources are lacking. Another way is to provide training on local species to police, fire fighters, and other emergency responders as well as park rangers. Keepers can obviously showcase their animals in educational displays wherever and whenever they can do so responsibly. Community events organizers are often very interested in hosting such displays. Don’t expect these people to know you exist—make your willingness to contribute known, either on an individual basis or as part of a local herp organization. My second recommendation as an action the “herp community” can take is to get involved in regulation of our interests. You’ll notice I included an asterisk in these arrows—allow me to explain. Regulations may seem like a negative, but the fact of the matter is that if WE don’t get involved, the regulations will still be imposed by someone ELSE (often taking the form of additional restrictions). It is difficult to make the case that bag limits are not needed, but the other side of the coin is that it SHOULD be difficult to impose “zero” bag limits—but with the “precautionary principle” mentality in vogue, that is sometimes what happens, because lawmakers simply do not have solid data with which to make their decisions. Similarly, would a permitting process for field herping and/or keeping reptiles and amphibians necessarily be a bad thing? That last sentence should really get your attention. You’ll notice I didn’t say WHO should be the overseer of a permitting process. I strongly advocate getting out in front of this concept, as a community of reptile and amphibian enthusiasts, by organizing into a coherent group and SELF-regulating. On at least one herp-related audio program this has already been proposed, using the SCUBA community as a model—there are essentially no laws pertaining to SCUBA diving, yet it is a safe pastime enjoyed by hundreds of thousands of people worldwide, because the community has self-imposed restrictions and guidelines. Proof of training, for example in the form of a certification card from a private organization (e.g. the Professional Association of Diving Instructors, or PADI), is almost universally required in order to rent equipment, get tanks filled, and so on. Similarly, it should be easy to conceive of a process by which prospective reptile and amphibian hobbyists could be certified by a national-level organization, with a hierarchy of certified instructors, to keep various species based on level of difficulty. Breeders and pet shops would participate by pledging to refuse to sell animals or supplies to anyone not able to produced proof of training, and perhaps offering a discount to people trained to a higher level. On the field-herping side, certification could be a means to gain access to additional herping areas (government lands heretofore off-limits) and give private landowners an extra measure of confidence toward people they permit on their property. This of course would be a complex task, but with the advent of several national-level organizations the groundwork has potentially already been laid. The momentum merely needs to continue—once we can reach consensus on which direction the organizations need to proceed. I hope this article has provided food for thought; while I realize the proposals contained herein are not final products, I do hope they provide material to further discussion. 1) In conservation circles it's abundantly clear that there are really two basic underlying threats to wildlife and wild lands: apathy and ignorance. A person can be sympathetic and yet act in incredibly harmful ways because s/he is ignorant of what is genuinely good or bad for the resource. Likewise, a person can feel nothing for the resource and yet have sufficient knowledge to realize that it needs to be properly managed for his/her own benefit. Your model should endeavor to accommodate this, and because it doesn't it's at least somewhat misleading (ignoring as it does the harm that sympathetic but ignorant people can do). "The road to hell...", don't you know. Continuing on, then, academic pursuits are decidedly positive, not neutral, in that they directly combat ignorance. They also do a great deal to enable proper resource management. 2) Finally, I'm sorry, but I think your overall goal is aimed too strongly in one direction. Lots of us, hopefully even most of us, want what's best for herps. But that's not necessarily much of a concern for many others of us (and I don't know how we ever determine just how sizeable that portion is, as most would understandably be reluctant to identify themselves as belonging to it). And even among those of us who want what's best for herps, that's actually probably not the main reason we're members of the herp community; it's much more likely that the desire to do right by herps (where it exists) grew from whatever other interests drew us to the community, not the other way around. Truthfully, I think that the diversity of interests in herps that prompt people to join the herp community is just fine (so long as said interests aren't illegal or clearly harmful), and that the herp community itself/members (and their various interests) themselves are at least as important to said community/members as is what's best for herps - and although these are hopefully aligned to a large extent, they're really not the same thing. I see the herp community as having tremendous potential to pursue what's best for herps, but your model makes it look (to me, anyway) as if people don't even belong in the herp community unless their purpose is to do what's best for herps - and that approach is decidedly and detrimentally exclusive. Let folks come to and stay in the herp community for whatever (legal and at least benign) reason(s) they wish, I say, and then try to focus at least a part of their energies toward doing what's best for herps. Quite the underwhelming response so far for this article... I was expecting more slings and arrows, or at a minimum, "good stuff" or "I am diametrically opposed to everything you wrote!" I do welcome any replies, rebuttals, counterpoints, etc. I see the herp community as having tremendous potential to pursue what's best for herps, but your model makes it look (to me, anyway) as if people don't even belong in the herp community unless their purpose is to do what's best for herps - and that approach is decidedly and detrimentally exclusive. Let folks come to and stay in the herp community for whatever (legal and at least benign) reason(s) they wish, I say, and then try to focus at least a part of their energies toward doing what's best for herps. It's not as if someone necessarily makes a conscious decision that "I'm in the 'herp community'" (I think my Join Or Die thread proved that it's difficult enough to define what the "community" is in the first place); it's more of a "you default into it by field herping/keeping/studying etc." I don't think there's a way (or really, a need*) to officially initiate someone into, or kick someone out of, the larger "herp community;" however, there are clubs, societies, etc. that can do so--but that requires conscious effort on the part of the individual to join in the first place. *the only thing I could envision where a "need" to exclude someone again falls on education--but in this case, educating the non-herping public that "person X does not speak for the field-herping/herp-keeping/etc community. His/her actions are frowned upon by conscientious herpers" or words to that effect. Whether such an approach passively or actively/unconsciously or consciously/etc. excludes people, the detrimental effect on the overall community and its potential for good work remains the same. I don't know why more people aren't chiming in with their thoughts. Your thread definitely deserves better than it's getting. Maybe everyone's busy just now, and they'll get to it before too much longer. gbin wrote: I don't know why more people aren't chiming in with their thoughts. Maybe they need to read it a couple more times, like me. It's a multi-faceted/layered concept and article, and I would like to think about it a little more before I say anything. But for the time being, I'll give it a preliminary "good stuff"! A great effort, particularly if you developed your graphics from scratch rather than adapt them from a "finding the common ground" 5 day workshop you had to attend! I made my contributions; a few pearls of wisdom, & some internal govt documents, many years ago, and after much discussion & internal analysis, i have determined for me, that the herp "community" is not sufficiently threatened to coaless around anything or anyone resembling "organization or leadership"! I've also come to the conclusion as ive posted before, that the unwashed publics need to be able to kill snakes as vermin, much like an intruding packrat, is the only reason we still have the comparatively liberal laws we do here in the USA. Some preliminary advice; have the + trends in shades of green, the negatives in shades of red. Common grd might be an inviting aqua-blue. The right to pursue happiness (Constitution). The right to interact and/or utilize our wildlife in a sustained manner (nature deficit disorder). The obligation to participate and contribute as a citizen/scientist. Sorry, thats all I'm willing to tap out for now. As someone new to forum, found the diagrams contextually helpful. While intuitively agree with much of it, I don't agree with "no take" photos only pointed negatively. For example, with limited range of "threatened," previously endangered Lake Erie watersnake, hobbyists taking them at certain times could have undermined their recovery efforts. Of course, I probably err on the "do not disturb" side with animals in the wild in general, so that likely colors my thinking. So, I'd have "no take photography" pointed to the beneficial, but appreciate the overall model's context for varied area of concerns with herps. Chris thank you for taking the time to write this out and making the charts, you gave a lot of food for thought . I agree with you completely on everthing you had to say. It would be great to see some form of training this alone would help to elimate some of the promblems we face impulse buying, It would educated buyers, ect. My personal oppion is that there is a common goal (to make sure that the reptiles and amphibians are conserved, so that we may continue enjoying the herpafauna related activiety we enjoy.) We need to find coman ground between use to reach the goal. A couple other ideas that might help in finding that common ground might be. 1. We might as a community adopt a overall agenda similar to the hunting and fishing community, http://www.fws.gov/hunting/whatdo.html We could lobby for voluntary taxes on herp related items, cages, field hooks ect also field herping stamps this is a starting point. This money being voluntary would be used only for herpafauna related agenda, resarch and/or conservation this would be made clear by our lobbist. 2. A good example of common ground between field herpers and those who are hand off only and herp keepers is comming up with a similar sytem like what is going on with the Morelia oenpelliensis (Oenpelli python) http://albinopython.com.au/oenpelli.html A similar system could help eliminate some promblems to help find some common ground and eliminate some of promblems associated with it, Precautionary principle, unregulated collecting, and restrictiions/ no natives. By using a sytem similar to hunters do they could issue a small number of stamps to collect a small numbers of the herpafauna desired for captive breeding purpose. Some regulations for this might be Collecting could be restricted in mid-to-late breeding season. They could then have a DNA sample taking, a pit taged would be issued and recored. The offsprings for sale would be issued a pit taged along with a certificate would be issued with each offspring the egg shell it was hatched in it would be sent with the certificate incase a questions of orgins arise's. My apologies for resurrecting an old thread for this, but I wanted to say how strongly I feel about this and how it simply and clearly explains how I feel about field herping. Thanks for sharing this. Thanks for resurrecting the thread MCHerper! I'm surprised I never saw it. I'll chime in that the diagrams are fantastically well-done. You put a lot of effort into this and executed it well. My big disagreement is that I would place "Irresponsible Development" in the giant down-facing arrow, while "the only good snake is a dead snake" would receive a side-arrow alongside road mortality. I think it is unambiguous that development has killed far more herps than the uninformed public could ever find on their own. Development has destroyed entire ecosystems far more comprehensively than snake-haters ever could. And, sadly, stopping the progress of development will be far more difficult than teaching people not to kill snakes, because it plays into some really deep subconscious motivations (the greed to possess more, the need to have status in the eyes of others, and the centuries-old American Dream/Manifest Destiny that moves us to all want to take more land and build on it) that are far more all-encompassing than the more narrow desire to hate snakes. If someone stops hating snakes, a small part of their world is changed. To get people to stop buying so much stuff (so more strip malls stop getting built) or stop desiring a big house and a big property (so more housing developments stop getting built) or stop thinking their status revolves around high-status exclusive outings (so more golf courses and ski resorts stop getting built)....that would require an entire shift in worldview. So if the giant down arrow is "development", what is its counter? I'd say that it has to be sustainable living. Can we ourselves practice a manner of living that would allow humans and herps to indefinitely coexist if everyone lived the way that we did? And can our way of living be appealing enough to attract others to it? I agree that somehow "education" has to be a big arrow in the up direction...but in my experience the greatest educational tool is personal example. And, in fact, psychology shows that few people make major decisions by rationally choosing between intellectual options (even if they claim this at some point much later after the fact). Instead, people tend to be drawn to other people whose lives they admire and want to emulate, and then over time they take on the intellectual positions that justify their allegiance to the new community they've become a part of. As someone pointed out above, first you become a part of a community that is involved with herps (often not even making a clear conscious decision to along most of the route), then you start hanging around herpers that care about conserving herps, and only then do you intellectually decide, "I want to care about the conservation of herps too!" Very few people read a paper or watch an educational program about the need to conserve herps and then suddenly change their lives in response. So I'd say that if we really want to change things for the better, we need to live herp-loving, ecosystem-loving, materialism-and-development-minimizing lives that other people envy and want to be a part of. And then show-and-tell others how to do it. That's a great contribution to the thread Jim. One fact that stood out to me was that 100% of people who "only keep herps" prefer the community to be self-policing, while only 50% of people who "only field herp" think self-policing alone is enough. Also, the more financial stake that people have in herps as a career, the less they think that self-policing alone is all that's required. It struck me that in some respects they're talking about policing completely different kinds of activities. Conflating these two aspects of the herping community is a bit like conflating "people who like raising cattle and people who like eating hamburgers" or "people who like working on cars and people who like racing cars". Sure, there will be a lot of overlap in terms of people who do both things, but the activities involved are still incredibly different, and the people who do only one, or only the other, tend to be so different from each other that it wouldn't really make sense to lump them anymore. Some of the people who do both sort of "bridge the gap", but in my experience many of them tend to fit more towards one end of the spectrum or the other in terms of personal views/motivations for being involved in herping. This survey didn't differentiate between "flavors" of financial stake. The way financial stake was determined was by how much of a respondent's income was due to herp-related activities, with no further clarification. Therefore, those people could be professional breeders, or academic researchers, or commercial collectors, or something else. I hope to fix that in the next survey to get a better feel for the views of the various groups. I'd hypothesize that private-sector guys would lean more towards self-policing, while academic researchers would lean more towards additional regulation. The survey was indeed a "snapshot" and I think I even included that phrase in the Executive Summary. hellihooks wrote: I think the more one learns, the less one keeps. Perhaps. I will explore this further in future surveys. In smaller-scale surveys (e.g. Snake Days participant surveys), lack of time/money as one gets older with more varied responsibilities, commitments, and interests has also been listed as a reason why people who used to keep herps no longer do so, with a smaller proportion of respondents citing ethical considerations. On a personal level, I still keep herps, but my rationale for doing so has morphed over time from "cool animal, I'd like to keep it" to "I'm going to keep it to track eating habits, growth rates, etc." That being said, the first rationale is probably fairly universal to young/inexperienced herpers, and likely leads to the second rationale (if they continue to keep vs. field-observing only). It depends on how one keeps and how one sees. There is data that can only be sourced by documentation per wild studies, but that doesnt discount the knowledge of what can be escavated in constant, intimate observation and comparative life histories. Neuroethologically focused herpetoculture is vivaria-as-laboratory. They are both important tools when at their best. When they arent its just entering the most numbers and showing off photography skills, or 'keeping' reptiles for entertainment or profit. Well, I produced it, but I purposely left my name off it...it's officially a publication of SWCHR. But thanks for the compliment...it took most of my free time over the past year and a half to pull it off. I already have 30 pages of notes to improve the next one (probably this fall). Unless of course the extent of overlap is so great as to make such comparisons meaningless and such grouping useful - as I strongly suspect is the case here. I've thus far only skimmed the survey and so don't know everything it contains (it's long and I've got a lot going on at present ), but did it pointedly ask those who field herp whether they also ever keep herps? If so, exactly how did it ask this? Both of my questions strongly pertain, as the most useful surveys are careful both to ask the right questions and to ask them the right way. For my part, I suspect that a very high percentage of field herpers do in fact keep herps (even if only off and on over the course of their field herping careers, or only under what they consider to be certain extenuating circumstances), but a great many of them might nonetheless not consider themselves - indeed, might vehemently deny to themselves and others that they are also - herp keepers, despite the fact that technically speaking they obviously are. With such a high degree of overlap, then, talk about "people who 'only field herp'" really becomes merely talk about an extreme minority (however much someone's wishful thinking might enlarge it and its significance in their imagination). Too, how different the activities involved are is really in the eyes of the beholder. In any event, the nice thing about surveys (especially those done skillfully with respect to asking the right questions the right way, as I mentioned) is that they produce actual data for people to consider. Such data are way more useful than jonathan's, my or anyone else's personal opinions. I strongly encourage people to look at and think about the data themselves, not to just settle for anyone's interpretation of carefully selected bits of it (let alone their opinions which are not apparently backed up by any of it). That's certainly been the case for me and a number of other people I've known. It becomes understandably more and more important to prioritize how one spends one's time as s/he gets older, and there are more and more items to prioritize, too. Herp keeping often ends up losing out to higher priorities. Chris, I can't imagine why you left your name off such a substantial piece of potentially useful work. Being officially a publication of SWCHR doesn't mean that you shouldn't have gotten clear credit/shouldn't have claimed clear responsibility for producing it. But if you're content with doing so anonymously, then I reckon that's what really matters. gbin wrote: Chris, I can't imagine why you left your name off such a substantial piece of potentially useful work. Primarily, it was because I am not seeking personal credit for something I hope is helpful for both the herping community and other entities who interact with them. But a secondary concern is that certain groups to whom the survey is passed are prospective employers, and I don't want them prejudging me before I apply/interview..."Oh, it's THAT guy." To use the same analogy again, nearly everyone who races cars also has worked on cars at some point. The overlap there is enormous. That still doesn't change the fact that racing a car and working on a car are incredibly different activities. My comment pertained to my realization that the people I know who only keep herps, and don't consider themselves field herpers, are quite different people in terms of their personalities and priorities than those who field herp, but who have never kept herps as a hobby. I would suspect that in terms of, say, political leanings, those two groups would show quite a bit of divergence. The fact that that particular survey question showed a 50% difference does lend evidence to my suggestion. None of that has anything to do with the fact that there is an enormous overlap of people in the middle like myself, who do both. Sort of like lumping amphibians and reptiles together...the cultural reasons that led to it don't actually mean they are similar things. jonathan wrote: ... The fact that that particular survey question showed a 50% difference does lend evidence to my suggestion. Not really, as there's no way to assess the strength of that evidence; it may be so weak as to not be worth considering. A 50% difference pertaining to an extreme minority (for all we know, representing <1% of self-identified field herpers overall) doesn't amount to much. It's not very meaningful, either, as extreme minorities tend to hold views that contribute to them being such. As I said, folks, you're better off looking for yourself to see what is - and isn't - in the data and deciding what it all means than paying much heed to anyone's interpretations/opinions of bits of it. jonathan wrote: Sort of like lumping amphibians and reptiles together...the cultural reasons that led to it don't actually mean they are similar things. I wouldn't be at all surprised if there are field herpers who focus on amphibians and view those who focus on reptiles as engaged in "completely different kind of activities," and vice versa. As I said, it's in the eyes of the beholder. And I don't think the herp community should waste time and energy trying to divvy up these people and their views, either. It's not only not meaningful, it's counterproductive. Ok, Chris, I get your secondary concern as a reason not to attach your name to your work. It's a shame, though, considering how much and how good work it is! The data would show that 19 out of 19 "herp keeping only" respondents answered "I generally agree" to that question, while 7 out of 14 "field herping only" respondents answered "I generally disagree to the same question. As I said, that falls in line well with people who identify solely within one or the other camp. I'm not trying to divide anyone. I have been serious about field herping and serious about herp keeping for most of my life, and I have never, ever been "anti-" either one of those communities. The more people in the boat together, the better. Still can point out, though, that they are very different activities, and could attract different kinds of people, no? I do apologize for helping put this thread on a weird sidetrack again - I thought it was an interesting thought and didn't mean to start a back-and-forth. I won't say anything more on that subject at all. jonathan wrote: The data would show that 19 out of 19 "herp keeping only" respondents answered "I generally agree" to that question, while 7 out of 14 "field herping only" respondents answered "I generally disagree to the same question. jonathan wrote: My comment pertained to my realization that the people I know who only keep herps, and don't consider themselves field herpers, are quite different people in terms of their personalities and priorities than those who field herp, but who have never kept herps as a hobby. I would suspect that in terms of, say, political leanings, those two groups would show quite a bit of divergence. The fact that that particular survey question showed a 50% difference does lend evidence to my suggestion. - A 50% difference pertaining to an extreme minority (for all we know, representing <1% of self-identified field herpers overall) doesn't amount to much. - It's not very meaningful, either, as extreme minorities tend to hold views that contribute to them being such. jonathan wrote: Still can point out, though, that they are very different activities, and could attract different kinds of people, no? Field herpers who are particularly amphibian or reptile enthusiasts might consider their activities "very different" from one another, too, and so could attract "different kinds" of people as well, no? Of course. There are literally countless ways to split us all up - but that doesn't mean any of them are meaningful to anyone other than the person doing the splitting. I worked hard to not include any "implications" in what the results meant within the report itself, but one possible implication is that people who consider themselves "herpers" but identify more (or solely) with "field herping" may campaign, testify, etc. against proposed herp-keeping ordinances--for better or worse. I think there's value in knowing, for example, that if 80% of respondents support or oppose a statement, that most of those have common thread (all have a STEM degree, or all keep only US native herps, or however you wish to filter the results to identify possible correlations). That being said, as I discuss in the report, there are problems assigning certainty to a survey such as this because 1) it's an opt-in vs. a truly random sampling, and 2) even so, the sample size was fairly small once you parse the respondents into categories such as "field herpers" or "Southwest natives" etc. I tried to be very careful in emphasizing the results are informative but not necessarily authoritative. The feedback I've received so far (from wildlife agencies and universities) is promising in that they're interested in the report and think it will be useful to them--I hope they offer suggestions for the next one to make it even better. gbin wrote: There also remains the questions I asked above, about whether the field herper portion was asked whether they ever kept herps (not just whether they also considered themselves herp keepers), and if so how they were asked this. Sorry, I was typing a response when your response came through, addressing the same concern (limitations of a web-based, opt-in survey which attracted a small sample size--you can't even calculate a confidence interval due to its nature). Page 338 of the report includes a question regarding whether respondents no longer keep or still keep herps of various origin (US native or non-native). I'd have to look through the analysis to determine whether I used the blanket "have you ever" question to delineate "herp keepers" or stuck with the "currently keep" category. For future surveys it may be interesting to split up "former keepers" and "current keepers" to gauge support or opposition to various topics. This survey was merely a starting point; I'd like to see future surveys refined to really help identify key issues which ideally unite, rather than divide; though it's beneficial (in my opinion, anyway) to at least get an appreciation of the perspectives of the different camps within the larger community. Those are very worthwhile caveats and a laudably cautious approach, Chris. Please don't think from what I wrote above that I consider your survey of little value, as that's not the case at all. I just think that people should be very careful in interpreting its results (and should do so for themselves rather than buying into anyone else's interpretations/opinions/extrapolations based on carefully selected bits of it), and that follow-up work is clearly called for. Which you yourself have said. From the little time I've spent with the survey so far, it looks to me as if much of its value might lie simply in giving us a glimpse of what goes into the self-identifications people make (e.g. "I'm a field herper" and "I'm a herp keeper"). I'll look at the pages you just referenced to improve my understanding of your data set. Thanks! gbin wrote: I just think that people should be very careful in interpreting its results (and should do so for themselves rather than buying into anyone else's interpretations/opinions/extrapolations based on carefully selected bits of it), and that follow-up work is clearly called for. Which you yourself have said. MOST people are not qualified to interpret data... so this suggestion is counter-productive. It's like saying everybody interpret the Bible for themselves... A data set that means something different to everyone who reads it, means nothing. Conclusions may differ (and that's fine) but leave the conclusions to those qualified to make them. And this, IMO: "If so, exactly how did it ask this? Both of my questions strongly pertain, as the most useful surveys are careful both to ask the right questions and to ask them the right way" is nothing short of insulting. hellihooks wrote: And this, IMO: "If so, exactly how did it ask this? Both of my questions strongly pertain, as the most useful surveys are careful both to ask the right questions and to ask them the right way" is nothing short of insulting. On the contrary, I fully agree. I spent a LOT of time writing and rewriting most of the questions before going live with the survey itself. I ran it through a test group and solicited feedback, and revised as needed. Even then, I found a couple of problems--grammatical/semantic ones (probably inconsequential) and questions that upon crunching the numbers realized they could've been interpreted more than one way. I welcome any and all suggestions, including for "tightening up" how questions are presented, in order to get the best possible resultant data. It doesn't mean I'll USE all the suggestions, but it's best to have other sets of eyes helping out. Of the many personal attacks Jim has aimed at me over the years, this certainly has to rank among the most laughable. First he asserts that only an elite group of people - of which I'm sure he considers himself to be a member - is capable of interpreting basic survey data. Whether there were many or few respondents, whether they amounted to a tiny or larger portion of the total number of possible respondents, whether or not any groupings or trends might be obvious or suggested in their responses... these are all things that the common person couldn't possibly see for themselves even if they looked hard. They need to be told what to believe, and then I suppose their job is simply to believe what they're told. Chris, I applaud, too, how seriously you prepared for your survey. I think you did a good job, as I said, and of course I believe, too, that your future surveys will be even better. If I see any concrete suggestions to make to you after I've looked it over more I'll be sure to pass them on. I didn't bother reading your reply Gerry (why bother...same ole same ole)... but nutshelling it... not an attack on you, but rather on what you said.... (basically) "let everyone figure out what the data means, to them" that's just dumb... why even bother doing research? Passive-agressively suggesting that Chris is not familar with 'framing' a question is In MY Opinion... insulting. If 'informing' us about 'framing' is ok (when everybody knows that) then certainally pointing out when you are again being insulting to people (something you never seem to be able to grasp) is fair play. I've conducted numerous surveys both on a professional basis and volunteer, as this one was. I've also scrutinized and provided feedback on other surveys on a wide range of topics, with suggestions on how to better frame their questions to avoid inadvertently introducing bias or error. Even the big-name agencies that do this stuff can come up with some pretty weird ways to get information (presumably because their clients desire particular answers to bolster their cause). Even with several years' experience doing this, there will nearly always be a "better way" to ask a particular question. In fact, the simple (yet lengthy) analysis process illuminated some of those better ways for the next go. And that's also why I welcome input, like "you might want to re-word Question X about [topic], because people may think it means [something else]." When initially building this survey I had people asking what the intent of certain questions were--I think they were hoping for particular outcomes. I tried to make the questions as neutral as possible and just see what the answers would be. That was part of the fun! Some of the answers were expected; some were surprising; but they all helped inspire additional and different questions for the next time. Chris, I didn't know you have all that experience conducting surveys, as I mentioned, but I guess I'm not surprised you do, either. As I and others have said, you did a good job! And as you and I have said, doubtless it could be (will be, next time) better still. I'd be delighted if it turned out that I could help in the effort. P.S. True story: I fired the last guy who said "This warn't my first rodeo, pardner!" to me, though not for that reason. Well, not mostly, anyway. I will admit that the expression is one of the things I decidedly don't miss now that I no longer live in TX. Given my trust in your compentancy to conduct research, your conclusions (if any are drawn) will carry significan't weight with me, and any input I may have will be tendered with due respect... but I know you know that already. Chris, you did a tremendous job with that report! Thanks! The next survey is already in work...hoping to run it Sep-Dec this year (to catch everyone going back to school etc.). It'll be shorter/more efficient this time, for both the participants' and my sanity.